No credit cards until you’re 21!! Starting in February, 2010, you’ll need a parent or guardian to co-sign in order to get your own credit card if you’re under 21. Or, if you can show you have sufficient income on your own to pay your credit card debt, then you don’t need a co-signer. Also, the co-signer must have a good credit history. 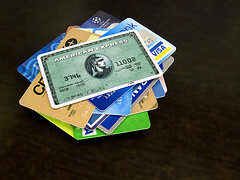 The Credit Card Accountability, Responsibility and Disclosure Act of 2009 is an attempt to keep credit card companies from targeting teens and twenty-year-olds. Especially vulnerable are college students – 84% have at least one credit card with an average balance of $2200.00 for education expenses, not including tuition. The Act also prohibits excessive fees, raising interest rates without warning, and penalizing customers who pay on time. During the first three months of 2009, late credit card payments were up to its highest level since 1974. What do you think of this new legislation? Do you think teens and young adults need to be protected in this way? As you know, you can vote, get married, own property, join the military, and serve on a jury once you turn 18. But now Congress decided that those under 21 need protection from themselves and credit card companies. Do you agree? What if you’re an emancipated teenager – should this new law apply to you? What about establishing credit early in your adult life? What about emergencies when a credit card is necessary? These issues were debated in Congress – what do you think?